Last edited by JW; 06-12-2013 at 05:40 PM. Guess I'm the first to check in. Good luck everyone. My season starts April 22 here in mid-Michigan. will be hunting all of april, wish all of yuo the best. I'll be hunting in Ohio, season starts late April. Good luck to all. Checking in. Our season doesn't start until May1st. SOOOO ready to give a thunder chicken a headache. 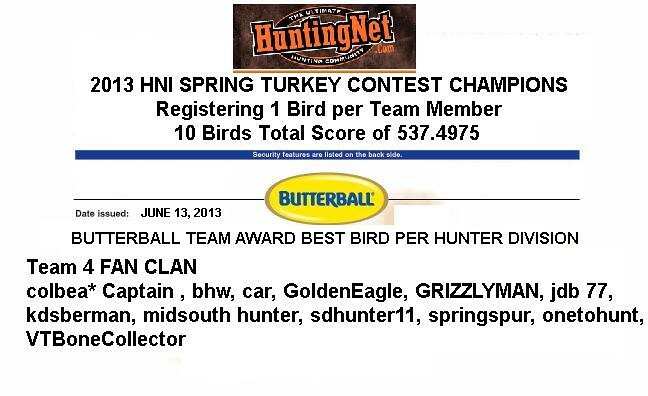 sdhunter11 checking in, my season runs from april 13th through may 19th. Hoping this goes as good as the last one did. My dad and I pulled off a double last season. Don't think it can get much better than that. He's getting up there in age and seems to appreciate every second we spend together in the woods. At least that's what I'm hearing when he thanks me, to no end, when he gets to harvest a critter that I set him up on. I am checking in. I'll be hunting in Oklahoma. Our season starts April 6. Good luck to everyone.